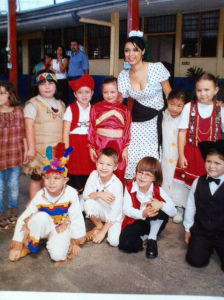 My name is Adriana Soto Horwitz and I’m an experienced preschool teacher from Costa Rica. I have 13 years of experience teaching English at a public kindergarten in Heredia, Costa Rica. I have also taught Spanish with Sombrero Time at Sierra Elementary, Rockin, CA (2015-2016). I provided private tutoring to public and private school students in Costa Rica up through high school in a variety of subjects. In April 2014, I moved to NorCal to live with my husband and our five-year-old son. I earned a BA degree in preschool education from Universidad Latinoamericana de Ciencia y Tecnologia in 2001 and have completed additional master's course work in preschool bilingual education at Universidad Hispanoamericana in 2005. Opening a Family Care Child Care preschool in my home is the fulfillment of a lifelong dream for me. Pura Vida!